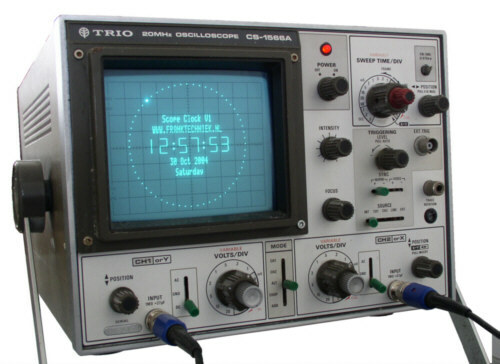 A while ago, while surfing the web I found an interesting idea for an oscilloscope clock. I have spend some time thinking about it first, and finally decided to make one myself. First I made a crappy version with a R2R resistor ladder network for a DAC to test the idea. The next improvement was to use a real DAC that works a lot better. The results were so good that I decided to make this project available as a kit. 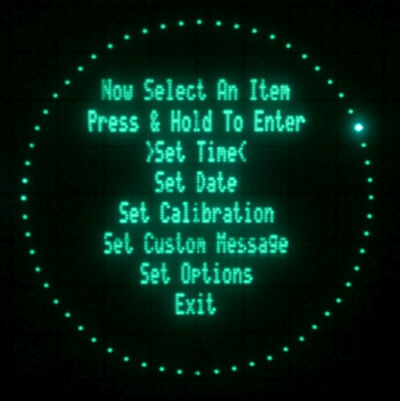 The idea is to display a working clock on the surface of a CRT tube as used in most oscilloscopes. It's not easy to find large numbers of identical CRT tubes, so I only made a kit that provides the x-y signals. You can connect this kit to any oscilloscope that supports x-y display. Practically any two-channel oscilloscope can handle that. There is no need for Z-modulation (intensity of the beam) as the trace moves very fast between the various parts of the picture. Credits go to the fast settling dual DAC, the most expensive part of the design. The image is very crisp, but remember to put the input channels in DC mode for the best result. This is how it looks on the oscilloscope. I used an old TRIO 20MHz oscilloscope to make the picture. The text 'www.franktechniek.nl' can be changed to your own personal text. If you want to use this kit to make a dedicated oscilloscope clock, it might be an idea to find a cheap second hand oscilloscope on Ebay. In that case you get all the important parts you need, the transformer, high voltage circuit, the deflection circuits and last but not least the CRT tube itself. You could remove the frontpanel, put everything in a new enclosure, and thus build your own unique oscilloscope clock. 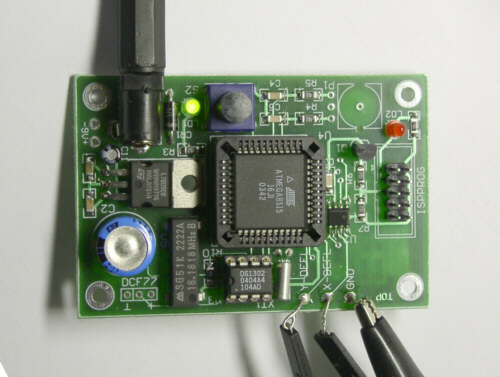 The circuit is build around an Atmel microcontroller AtMega8515. It drives a dual DAC to generate the x and y voltages. It has provisions for a DS1302 Real Time Clock too, so it can keep time while the power is off (RTC option). The board also has provisions for a programming interface, in case you want to develop your own software. I used the free GCC/AVR C compiler to develop the software. The software mainly runs around in circles, pumping out the commands to the dual DAC as fast as possible. Both outputs are updated at the very same moment, resulting in a nice sharp image. I used large portions of my nixie clock software, so it more or less works and behaves in the same way. The clock can be calibrated and will run very accurate, typically within 2-3 seconds a week. All settings are done with a single button, in much the same way as with my nixie clocks. However, with this clock it's even easier as it presents a nice menu on screen, see below. The thin horizontal and vertical black lines that we see here, are the oscilloscope's graticule, not some quirk in the software or electronics. The kit can be ordered in my web shop. Also consider the RTC option. I tried to keep the price low, but making kits in these very low quantities does not allow for a really low price. On the other hand, this is a rather funny gadget for the home lab. The software does not have support for a DCF77 signal decoding (Europe's atomic radio clock) because of the limited 2K program memory. Perhaps I can add that later, after some optimizations, but I strongly doubt it. I've included a day-of-week computation too. I think it is a very nice kit, and if you can build it into an old oscilloscope, you can be the proud owner of very unique clock. 0009 - Neil, USA, see picture here. 0010 - Last one in stock!